Jigsaw Junction is a center-based organization where supervisors and technicians work together with your child, in one centralized location. The organization hires and employs behavior technicians so families are able to focus on their children instead of managing technicians. With behavior analysts and their assistants working together, we can ensure the highest quality of services available. Your child has the opportunity to work with a Program Manager weekly and progress is constantly monitored to optimize success and learning. With this high quality approach and intensive monitoring, each learner will be introduced to new programming on an ongoing basis. Steady communication with technicians improves reliability of data, allowing parents and supervisors to track and respond to progress. This model can also encourage and monitor interactions between students in small groups. This prepares students for the learning environment of a typical classroom. Sessions with students are held Monday through Friday and are highly structured to optimize learning and progress. All students work to increase time on task and independence during the scheduled independent work period. In addition to intensive one-on-one instruction time, Jigsaw students also have the opportunity to engage in social behavior objectives during our group activities, snack and circle times. 9:10-10:00 Students engages in one to one instruction mixed with structured play breaks. Play breaks may be with the instructor or with other students. Arrival: It is recommended that your child arrive at the center approximately 5 minutes prior to the scheduled session. When your child is late, the services provided to your child and other children are affected. In the case of a late arrival, please note that you will be billed for the full duration of your scheduled session and the session will not be extended in order to make up for the missed time. If a delay in the start time of your child’s session is the fault of any staff member, you will not be billed for the delay. If students arrive late by 30 minutes or more and we have not been notified, the session will be cancelled and billed in full. If you notify us of a late arrival that will exceed 30 minutes, but want to continue the scheduled session, you will be billed in full at the previously negotiated rate. Cancelled sessions cannot be billed to insurance and are therefore the financial responsibility of the client. Pick-Up: Parents/guardians should arrive 10 minutes before the end of your scheduled session. This allows for time to discuss your session summaries. Arriving later than 5 minutes past your scheduled session end time (12:05 p.m., 3:35 p.m., 6:05 p.m.) will result in a $2.00/minute late fee. This is not billable to insurance and will be included in your next invoice. Time of day is noted according to the digital clock located in the Jigsaw waiting room. Currently, Monica Chen, Mary Tinsley, Tracey Gerhardt, and Amy Hatten conduct the program management of Jigsaw Junction. They all hold the credential of Board Certified Behavior Analyst (BCBA) and resumes are available upon request. As Director and Clinical Supervisor, Monica and Mary maintain close oversight of instruction and programming decisions for all students. Jigsaw Junction employs its own Behavior Technicians (BTs). All technicians undergo a rigorous training process with the Director and Clinical Supervisor before working independently with children. In addition to being monitored and critiqued daily by supervisory staff, additional and technique specific trainings are conducted monthly. Staff performance is further monitored by a thorough review process. 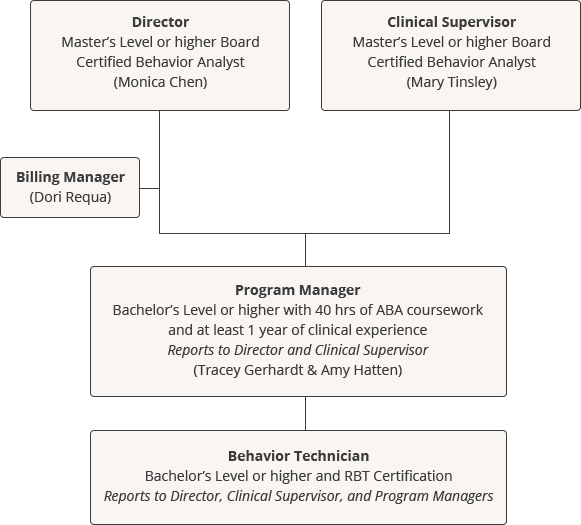 Beginning in 2014, Jigsaw staff began additional coursework in order to qualify as Registered Behavior Technicians (RBTs) through the Behavior Analyst Certification Board (BACB). The RBT is a new credential instituted by the BACB and we are very proud to boast that Jigsaw staff were among the first Registered Behavior Technicians in Washington State. After an initial tour and meeting, new families will be scheduled for an Intake Meeting prior to entering Jigsaw. The Director, Clinical Supervisor, and/or a Program Manager will meet with the new family for approximately one hour. During this time, we will review background information and learner history with regards to your child. We will also discuss your short-term and long-term goals for therapy. To help acquaint you with the center policies, we will review key points in the Family Policies Manual. Upon entering the program, each child will undergo an assessment conducted by a Program Manager. The type of assessment used will be determined by the Program Manager. There is no additional cost for the assessment. The assessment usually lasts between two and four sessions, depending on the learner level (i.e., a learner with many skills will need to be assessed for longer than a learner with fewer skills). The assessment occurs during the first few sessions of therapy; we do not need to schedule separate sessions for assessment purposes. After the completion of the assessment, your Program Manager will summarize the results and write programs to address your child’s deficit areas. We will also incorporate any program requests from you into your child’s program notebook. When all programs have been implemented and results of the assessment graphed, we will coordinate a meeting with you to go over the results of the assessment as well as the programs written for your child. This meeting lasts approximately one hour. This is a good time to bring up any additional questions you may have regarding programming or policies. At various times throughout the year, Jigsaw conducts progress report meetings with parents. During these meetings, we go over your child’s program book and talk about your child’s progress. These meetings usually last 30-45 minutes. At least one week prior to the meetings, a Jigsaw administrator will notify families that meeting times are available. Meetings are scheduled via email on a first come, first served basis. JJ101: Introduction to Applied Behavior Analysis The first class in our series, JJ101, introduces participants to the definition of Applied Behavior Analysis, the importance of credentials of a Board Certified Behavior Analyst, as well as the components of the three term contingency of operant behavior. In addition, prompting, generalization, and token economies are also covered. JJ102: More About Reinforcement (& Punishment) Primarily focused on reinforcement, this class goes deeper into the definition of reinforcement and punishment. Through group exercises, participants have ample practice recognizing different types of reinforcement and learn the importance of schedules of reinforcement. JJ 102 also introduces the concept of Motivating Operations and how caregivers can manipulate MOs to increase the probability of reinforcement. Planned Ignoring is also introduced in JJ102. JJ103: More About Prompting & Prompt Fading This focus of JJ103 is prompting and prompt fading. Through examples and group exercises, participants will learn about stimulus prompts and response prompts, and how to recognize them in their daily activities. They will also learn how to implement prompts, as well as techniques to fade prompts. JJ104: More About Token Economies (with Make-It-Take-It) This is the fourth and final class in the JJ100 series. In this class we will spend time reviewing the definition of a token economy as well as techniques for implementing them in the home. Participants will be introduced to different types of token boards and have an opportunity to make a token board for their child(ren). As an important part of any intervention package, there are additional services that parents may select to include in their child’s treatment plan. These include, but are not limited to: IEP meetings, school observations, home observations, meetings with teachers, toilet training in homes, etc. To schedule these additional services, please contact your Program Manager. In an attempt to keep costs low for all of Jigsaw Junction’s clients, these additional services are charged only to those families who elect to participate in these added services. These services, including travel time if applicable, are billed at the currently published billable rate of $38 per hour and are billed in 15-minute increments. Student schedules are arranged bi-annually. School year schedules occur from September until June. Summer schedules span the months of July and August. Please submit requests in writing to the Clinical Supervisor by August 1st (for school year schedules) and by June 1st (for summer schedules). If a permanent schedule change is required outside of these dates, please submit schedule change requests in writing 30 days prior to the desired schedule change. Changes to each child’s schedule will be granted on a space-available basis. Jigsaw Junction will provide a calendar of scheduled holidays. While cancellations may occur for a variety of reasons, they affect the progress and effectiveness of any intervention program. The policies set forth by Jigsaw Junction are aimed at minimizing the impact of cancellations and increasing the effectiveness of intervention plans. If excessive cancellations are made within a two-month period, the Director will request a meeting with the family to discuss schedule options. Planned Absences: Planned absences should be arranged with the Clinical Supervisor via e-mail at least 2 weeks prior to the scheduled session. Absences communicated less than 2 weeks prior to the scheduled session will not be eligible for make-up sessions or a tuition refund. This policy does not apply to planned absences of more than 2 weeks. Non-Planned Absences: Non-planned absences should be communicated at least 1 hour prior to the session via e-mail or phone to your program manager. Non-planned absences may occur due to illness, transportation difficulties, or any other unforeseen circumstance. Absences communicated less than one hour prior to the start of the session risk being billed in full without the option of a make-up session. Make-Up Sessions: Sessions that are cancelled while adhering to the policies outlined above are eligible for make-up. Make-up sessions are encouraged to be scheduled within the current month, but must occur within six months of the cancelled session. Any sessions not made up within six months will be forfeited and no refunds given. Make-up sessions will be scheduled based on staff availability and double booking is not permitted (booking 2 or more sessions in one day). The financial value of the make-up session is based on the original session value; therefore, partial refunds are not available. No make-up sessions will be scheduled on dates that the clinic is closed. In the event that your child attends 5 days a week, making scheduling an extra session problematic, you will be credited for missed sessions provided that the cancellation follows the policies outlined above. If Jigsaw Junction cancels additional sessions outside of the calendar holidays, you will be credited those missed hours of therapy at the currently published billable rate. This does not apply to inclement weather cancellations. Some families may choose to take extended vacations at various times throughout the year. Jigsaw respects these personal choices. However, extended absences or disruptions in therapy can result in regression in our students. If a student is absent from therapy sessions in an excess of two weeks, Jigsaw bills the family at 50% of the tuition for the duration of the student’s absence. During the first two weeks of absence, make-up sessions are allowed and encouraged. For those families with insurance coverage, Jigsaw cannot bill the insurance company for these absences in excess of two weeks. Therefore, the family will be billed directly for these missed sessions. Extended absences due to family emergencies can be negotiated on a case-by-case basis. The health and safety of all of our clients is a priority for Jigsaw Junction. Therefore, children with fever, infections, or other contagious symptoms will not be admitted to the center. If a child develops these symptoms during his/her scheduled session, we reserve the right to contact the parent/guardian to schedule an early pick-up. It is the parents’ or guardians’ responsibility to schedule make-up sessions for missed sessions due to illness. The safety of our clients and staff is of the utmost priority. In the event of inclement weather, Jigsaw Junction will follow the guidelines set forth by the Lake Washington School District. Please stay tuned to your television and/or internet to find out whether a late start or school cancellation is in effect. If inclement weather happens to occur on a non-school day (i.e., Jigsaw is open more days than the public school district), an administrator from Jigsaw (usually the Director) will email you about the status of therapy sessions. If you choose not to attend a session that has not been cancelled, please notify the Clinical Supervisor as soon as possible. Sessions cancelled due to inclement weather will not be credited to clients’ accounts. In the event of a request for a student’s withdrawal from the program, parents must provide 10 (business) days’ advance written notice to their Program Manager. Tuition for the month will be pro-rated for the remainder of the month. If notice is given fewer than 10 business days, tuition will continue to be billed for the 10 business days following the date of the notice. If reasons for withdrawal are emergency in nature, Jigsaw administrators may grant a waiver of advance notice requirements. For private pay, services are calculated based upon a discounted rate of $38 per hour. If you are paying with insurance, the billable rate may vary depending on the arrangement Jigsaw has with your insurance provider. As a courtesy for families served by insurance companies, Jigsaw Junction will submit claims to your insurance company directly. Most insurance companies will submit payment within 60 days. Billing invoices are sent out at the beginning of the month for the previous month’s services, and payments are due within 10 days of receipt of the invoice. If the due date falls upon a weekend or holiday, payment is due on the following work day. If part of your funding source is an insurance company, Jigsaw Junction will file claims for the previous month’s services at the beginning of the new month. Once payment is received from the insurance company, Jigsaw Junction will invoice you for the patient’s portion of the invoice. If full payment is a financial hardship, you are advised to coordinate with the Billing Manager at Jigsaw Junction to mutually agree upon a payment plan. After 3 months of non-payment, Jigsaw reserves the right to suspend services. If travel to an outside location is required by one of our clinicians, Jigsaw Junction bills for travel time that is only in excess of 20 minutes, each direction. Travel time is billed in 15-minute increments at the $38/hour rate. Insurance companies will not cover travel time; therefore, travel fees are billed directly to families. Clients arriving late to a session run the risk of the session being cancelled. These sessions cannot be billed to insurance and therefore are the financial responsibility of the client. In addition, arriving to pick up your student later than 5 minutes past the scheduled session time (12:05, 3:35 pm, 6:05 pm) will result in a $2.00/minute late fee. This is not billable to insurance and will be included in your next invoice. Absences (planned or non-planned) that do not adhere to the policies outlined cannot be billed to insurance and therefore are the financial responsibility of the client. Make-Up sessions must be scheduled within six months of the cancelled session. Any sessions not made up within six months will be forfeited and no refunds given. The financial value of the make-up session is based on the original session value therefore partial refunds are not available. For more specific information regarding absences and make-up sessions please refer to our Scheduling policies. Payments received after the due date are subject to a $25 late fee. If the tuition due date falls upon a weekend, the late fee will be applied after the following business day. Students whose tuition payments are not received by 45 days from the date of billing will be subject to termination of services. Returned checks will result in an additional charge of $25 plus bank processing fees. Please direct all billing questions to our Billing Manager, Dori Requa, at drequa@jigsawjunction.com. Jigsaw Junction maintains an open door policy for parents to observe their children during therapy sessions. When observing, please respect the responsibilities of our instructors by allowing them to perform their job without too much interference. We reserve the right to limit the number of observations so that we keep distractions in the classroom to a minimum. Whenever possible, we ask that you request observations ahead of time in order to minimize disruptions in the classroom. At Jigsaw Junction, your consumer satisfaction is one of our utmost priorities. If you have a complaint or a grievance with how services are conducted, we encourage you to speak openly and frankly with an administrator. Please direct your comments or concerns to any of the individuals at the center who hold a BCBA. They will also relay the grievance to the Director. We will maintain your confidentiality and will do our best to resolve any issues you may have. If you are not satisfied with how we have handled your situation, it is your right as a consumer to escalate and/or report the problem to the Behavior Analyst Certification Board (www.bacb.com).